KITRCPA412RCPH146 - Value Kit - Rubbermaid Web Foot Finish Mop (RCPA412) and Rubbermaid Invader Fiberglass Side-Gate Wet-Mop Handle (RCPH146) by Rubbermaid at Blog Free Here. MPN: RCPA412RCPH146. Hurry! Limited time offer. Offer valid only while supplies last. lt;stronggt;RCPA412lt;/stronggt;lt;BR/gt;Rubbermaid Web Foot Finish Moplt;BR/gt;Looped-end floor finish mop constructed with 4-ply synthetic yarn. lt;stronggt;RCPA412lt;/stronggt;lt;BR/gt;Rubbermaid Web Foot Finish Moplt;BR/gt;Looped-end floor finish mop constructed with 4-ply synthetic yarn. Tailband sewn inside the mop to help reduce drag patterns during floor finishing. 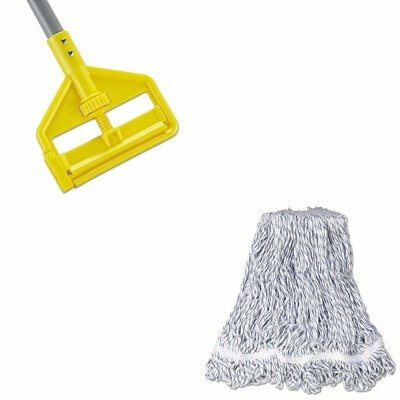 Head Type: Wet Mop Application: Floor Maintenance Mop Head Style: Looped End.lt;BR/gt;lt;BR/gt;lt;stronggt;RCPH146lt;/stronggt;lt;BR/gt;Rubbermaid Web Foot Finish Moplt;BR/gt;Easy-change, side-gate design allows you to quickly slide mop heads on or off. Adjustable thumb wheel enables stress-free, tight and secure clamp down. Solvent- and acid-resistant frame enables use with all commercial floor stripping agents. Handle Length: 60amp;quot; Handle Diameter: 1amp;quot; Handle Material: Fiberglass.